On the two year anniversary of the sinking of the Sewol, dozens gathered at a public event in Seoul to discuss the factors that led to the April 16, 2014 ferry sinking that killed more than 300 people, most of whom were high school students on a field trip. April 16th, 2016 marks the two anniversary of South Korea’s worst maritime disaster when the Sewol Ferry sank on a routine trip from Incheon to Jeju Island while transporting hundreds of high school students on a field trip. KoreaFM.net asked people on the streets of Seoul about the anniversary, how South Korea has changed since the sinking, & if the real truth of what happened will ever be known. Robert Koehler & Chance Dorland discuss a New York Times article that makes the case that the Park Geun-hye administration is using the country’s defamation laws to silence critics. The duo then finishes with a quick discussion of how bad Donald Trump would be for freedom of speech in the US. 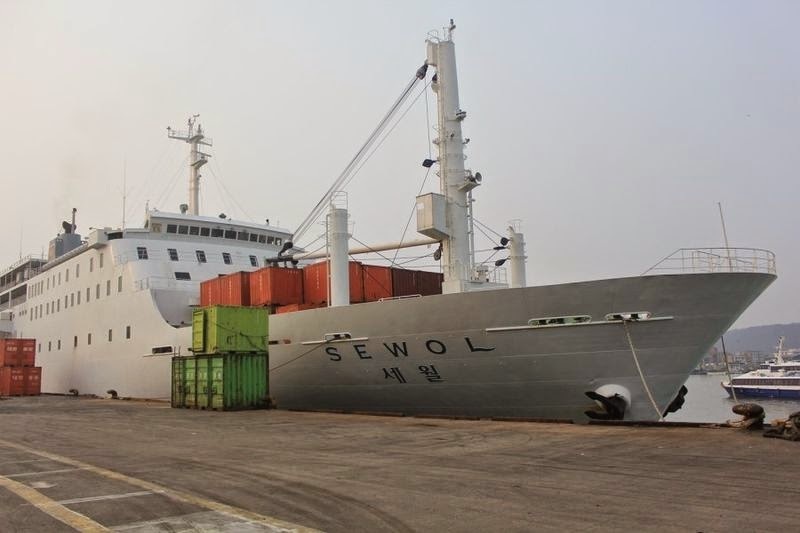 The sinking of the MV Sewol (세월호 침몰 사고) occurred on April 16th 2014 en route to Jeju from Incheon. At this point 278 people have died and 29 people are missing from this tragedy. One of the reasons why this situation is so heartbreaking is because majority of those on the ferry were high school students from Danwon High School, from Asan. 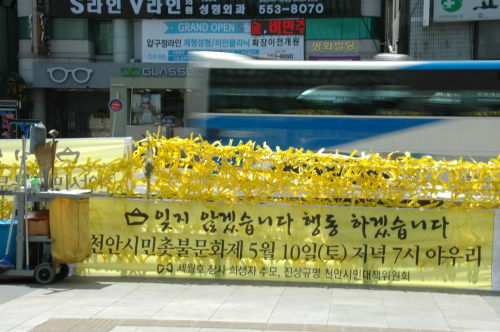 All over Korea, people are tying yellow ribbons with messages at public, temporary memorials for victims. Candlelight vigils and public demonstrations to impeach President Park Geun-hye are a regular occurrence these days. Events (e.g. festivals, music concerts, and individual school celebrations such as Sports’ Day) are still being canceled out of respect for the victims, which is both touching and annoying. On June 12, 14 years will have passed since my mother died. On my birthday this year, April 16, another tragedy occurred in my current home, South Korea. The Sewol ferry accident that resulted in the loss of so many lives, many of them teenage children, would be a tough pill to swallow anywhere. In a country as small as this, it knocked the wind out of an entire nation. I was asked if I wanted to write something about it. I said I would, but did not want to exploit someone’s pain for egotistical tears. For 14 years, I have been hesitant to write publicly about my mother’s death for fear of the same. But, a lot has changed since 2000. Fourteen Mother’s Days have come and gone. This Mother’s Day, hug your moms if you can. As I’m sure you’ve seen in the news, South Korea is devastated over the loss of life in the Sewol Ferry tragedy. There are confusing, conflicting responses to this tragedy, really the first major national catastrophe since the country was created after the Korean War. For a culture that so highly values trust and respect, the idea of departmental and government oversights causing a loss of life this immense is overwhelming. Just today, the country’s prime minister 정홍원 (Jeong Hong Won) resigned amid a hail of controversy about government inefficiency. Distraught parents have threatened to march on the Blue House (South Korea’s presidential residence) in protest and are vocally and emotionally castigating a government they feel has failed to save their children. Whenever a tragedy strikes Korea, many Western observers can’t resist the urge to attribute it to Korean culture. In the aftermath of great tragedies, one must be thorough in drawing conclusions about the causes and the way people respond in times of trouble and be careful not to explain away matters on handy scapegoats. Asking pertinent questions is very much a part of this.